Pours a clean yellow color with a dense, fluffy, white head. The aroma is of yeast and straw. The flavor follows but opens up new characteristics. Strong barnyard flavors: earthy, a lot of yeast, a lot of straw, and some funk. It has a light feel in the mouth and finished well. Poured from 750mL corked & caged green bottle into a tulip. Appearance: light golden hue with a moderate to light haze and a strong effervescence. Head is two fingers of frothy white foam with moderate retention. Not too bad. Smell: lightly sweet with a little bit of malt and a good bit of graininess. There's just a hint of funk, which is nice, but also a little dab of green bottle skunkiness which, thankfully, wafts away relatively quickly. Taste: a little sweet, a little grainy and lightly funky. The hops aren't strong but add a nice green grassiness to the overall flavor. Very light, but nice. Mouthfeel: medium-light body with a good carbonation and a big, mouth-filling creaminess; great for the style and the low ABV. 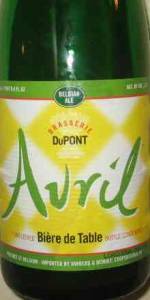 Overall: it's hard to get a big flavor out of such a small beer, but Dupont does a pretty good job here. That said, the low ABV, big fizziness and big vernal attitude make this beer colossally drinkable. Woo! This clear, lemon-yellow beer produces a big foamy head of ultra-fine pure white bubbles, even with a careful pour. It looks like it's topped with meringue. This smells like springtime. It's like walking into a flower shop. So light, with a hint of tartness. I want to bury my nose in the glass and breathe deeply. Of course, it's hard to find room for my nose with all that foam. Such a clean taste. It's a little grassy, a hint of lemon zest. Now I'm catching some dandelion, both on the tongue and in the nose. There's none of the tartness suggested by the aroma. It has a perfect, cleansing bitterness in the finish. If there's anywhere this disappoints me, it's mouthfeel. At 3.5%, this is obviously going to be on the thin side. It's certainly well-carbonated, but unlike some others in the style, this beer doesn't have the fine carbonation that reminds me of drinking champagne. Maybe I'm just being picky. I have friends who insist there's nothing better than an American adjunct lager when it's hot out, and you've just finished mowing the lawn. I beg to differ. This beer is supremely drinkable, and I made short order of a 750ml bottle in the dead of Winter. In the Summer, this would be killer. A - Pours a hazy light orange-yellow with a big white head with good retention and lots of lacing. S - Floral, spices, a touch of funky farmhouse. T - Light tartness, lemon, wheat, floral, list spices. D - Light with good carbonation. O - A nice Belgian table beer. Light citrus and floral. Poured from 750mL bottle into imperial pint glass after a long week of work. Golden, slightly hazy pour with bright white head that retained and laced well. Citrus and slight yeast aroma. Was hoping for a sessionable Belgian when I bought it and that's just what I got. Mouthfeel is crisp and light. Tastes are tangy lemon up front, peppery finish, slight grassy and floral notes. Highly drinkable, wish I'd bought another. A- Very pale yellow body with crystal clear transparency. Very bubbly head that poured like a champagne and settle down to a thin layer. S- Lemony citrus, hint of what smells like pilsner malt, dried grass. T- Sour lemon, light bready malt, fresh herbal flavors. M- Light and bubbly, high carbonation. O- Very good beer that could serve as more than just a table beer. Enough flavor to get by. A-hazy straw yellow with a soapy looking head, very large. about 4 finger head. S-smells of a skunk, lemon, grassy and soggy wheatabix cereal come to mind. Not sure about this one. Lots going on though for a 3.5% beer. T-complete difference from smell. Starts with a lemongrass and then dyes. very bland after that other than a very very small does of wheat/malt. O-had higher hopes for this one...will not buy again. Hay aroma a little mineral in the nose. Golden yellow with a slight haze but fairly clear with a great head that leaves nice lacing. Taste is sharp but strikes a good balance between the pilsner hops and yeast. The finish is really clean given its full flavor up front.